UseEN-44887wrenchto remove the oil filter cap-(1). Remove theoil pan drain plug and allow the oil to drain out.Remove the oil filter-(2) from the cap anddiscard.Clean the oil filter housing in the engine block. 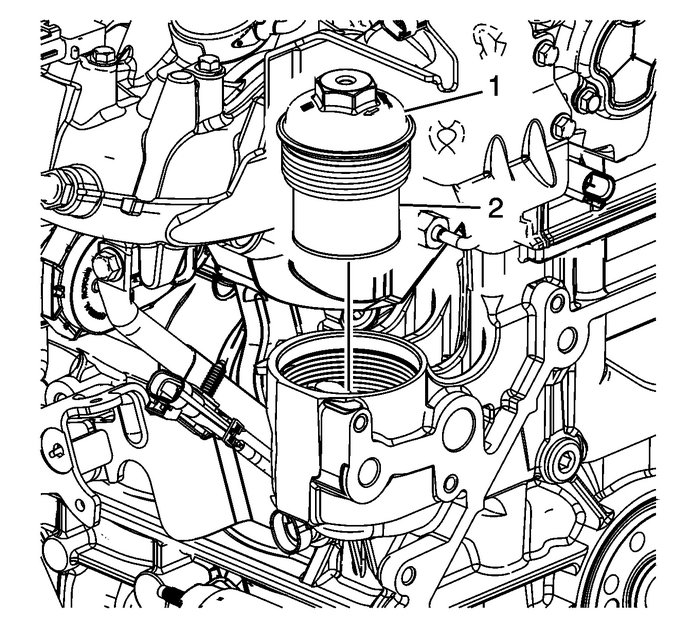 Install the oil pan drain plug and tighten to25-Y(18-lb-ft).Remove the water pump drain plug from the water pump andallow the coolant to drain from the water jacket.Apply sealant to the water pump drain plug. Refer toAdhesives, Fluids, Lubricants, and Sealers.Install the water pump drain plug and tighten to20-Y(15-lb-ft).If cleaning or repairing the engine block, it is notnecessary to reinstall the plugs.